For the Indian instrument, see Santoor. Sadeghi-Dehlavi-Concertino for Santur by Faramarz Payvar. Woman playing the santur. Fragment of the painting "Musical gathering" by Ibrahim Jabbar-Beik (1923-2002). The santur (also santūr, santour, santoor) (Persian: سنتور‎, Arabic: سنطور‎) is a hammered dulcimer of Iranian or Mesopotamian origins. 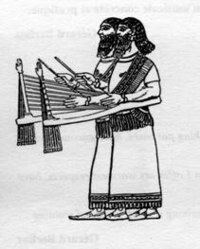 The santur was invented and developed in the area of Iran, Kuwait, Syria and Turkey, and parts of Mesopotamia (modern-day Iraq). This instrument was traded and traveled to different parts of the Middle East. Each country customized and designed its own versions to adapt to their musical scales and tunings. The original santur was made with tree bark and stones, and stringed with goat intestines. The Mesopotamian santur has been claimed to be the father of the harp, the Chinese yangqin, the harpsichord, the qanun, the cimbalom, and the American and European hammered dulcimers. The name 'santur' has several possible derivations. It has been thought by some to be derived via Aramaic from the Greek psalterion (Greek: ψαλτήριον, "plucking instrument"), which quickly became the generic term in the Greek world for a plucked instrument and which was widely used across the Graeco-Roman world, including Syria and Northern Mesopotamia. The earliest Aramaic form is psantērīn in the late Biblical book of Daniel (Daniel 3:5), already close to an alternative form of the Arabic, sanṭīr. Alternatively the word may be of Iranian origin, meaning "a quick accent" or perhaps "one hundred strings". A further suggestion is that the name is derived from Sumerian "sant" and "Ur", meaning sound of Ur in Sumerian. The oval-shaped Mezrabs (mallets) are feather-weight and are held between the thumb, index, and middle fingers. A typical Persian santur has two sets of nine bridges, providing a range of approximately three octaves. The right-hand strings are made of brass or copper, while the left-hand strings are made of steel. A total of 18 bridges divide the santur into three positions. Over each bridge cross four strings tuned in unison, spanning horizontally across the right and left side of the instrument. There are three sections of nine pitches: each for the bass, middle and higher octave called behind the left bridges comprising 27 notes altogether. The top "F" note is repeated twice, creating a total of 25 separate tones in the santur. The Persian santur is primarily tuned to a variety of different diatonic scales utilizing 1/4 tones which are designated into 12 modes (dastgahs) of Persian classical music. These 12 Dastgahs are the repertory of Persian classical music known as the Radif. They also had 16 inch botos. Similar musical instruments have been present since medieval times all over the world, including Armenia, China, Greece, India, etc. The Indian santoor is wider, more rectangular and has more strings. Its corresponding mallets are also held differently played with a different technique. The eastern European version of the santur called the cimbalom, which is much larger and chromatic, is used to accompany Romani music. The archetype of the instrument carried horizontally and struck with two sticks, found in iconographical documents in ancient Babylon (1600-911 BCE) and neo-Assyria (911-612 BCE). The Iraqi santur (also santour, santoor ) (Arabic: سنطور‎) is a hammered dulcimer of Mesopotamian origin. It is a trapezoid box zither with a walnut body and 92 steel (or bronze) strings. The strings, tuned to the same pitch in groups of four, are struck with two wooden mallets called "midhrab". The tuning of these 23 sets of strings extends from the lower yakah (G) up to jawab jawab husayni (a). The bridges are called dama (chessmen in Iraqi Arabic) because they look like pawns. It is native to Iraq, India, Pakistan, Turkey, Iran and Azerbaijan. It is the main instrument used in the classical Maqam al-iraqi tradition along with the Iraqi spike fiddle joza. ('Music of the Arabs' ISBN 0-931340-88-8). The instrument was brought to Europe by the Arabs through North Africa and Spain during the Middle Ages and also to China where it was referred to as the "foreign qin". The Iraqi santur has, since its inception, been fully chromatic allowing for full maqam modulations. It uses 12 bridges of steel strings on both sides. Three of these bridges are movable: B half flat qaraar, E half flat, and B half flat jawaab. The non-standard version of the Iraqi santur includes extra bridges so that there's no need to move those three bridges. However, playing it is a bit harder than playing the standard 12-bridge santur. For a video demonstration, see Wesam al-Azzawy's video links in the sections below. Versions of the santur or hammered dulcimer are used throughout the world. In Eastern Europe, a larger descendant of the hammered dulcimer called the cimbalom is played and has been used by a number of classical composers, including Zoltán Kodály, Igor Stravinsky, and Pierre Boulez, and more recently, in a different musical context, by Blue Man Group. The khim is the name of both the Thai and the Khmer hammered dulcimer. The Chinese yangqin is a type of hammered dulcimer that originated in Persia. The santur and santoor are found in the Middle East and India, respectively. ^ a b Farrokh, Kaveh (2007). Shadows in the desert : ancient Persia at war (1. publ. in Great Britain ed.). Oxford, UK: Osprey. p. 286. ISBN 9781846031083. 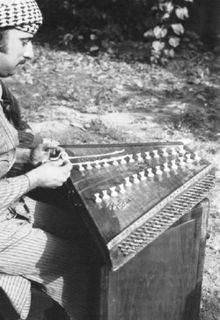 ^ "Santur is a hammered dulcimer, consisting of a trapezoidal box with horizontal strings, played with oval shaped featherweight mallets known as mezrab". Art Max Academy. ^ --- Rashid, Subhi Anwar (1989). Al-ʼĀlāt al-musīqīyya al-muṣāhiba lil-Maqām al-ʻIrāqī. Baghdad: Matbaʻat al-ʻUmmāl al-Markazīyya. ^ a b c Touma, Habib Hasan (1996). The Music of the Arabs. Portland, Oregon: Amadeus Press. ISBN 0-931340-88-8. ^ a b Faruqi, Lois (1981). An Annotated Glossary of Arabic Musical Terms. Westport, CT: Greenwood Press. p. 296. ISBN 031320554X. ^ West, M. L. (1992). Ancient Greek Music. Oxford, UK: Oxford University Press Press. p. 70. ISBN 0-19-814975-1. ^ Montgomery, James A. (1927). A Critical and Exegetical Commentary on the Book of Daniel. Edinburgh, UK: T&T Clark. p. 203. ISBN 0567050173. ^ "Bass strings made of Brass or Copper". Art Max Academy. ^ "Different kinds of Steel exist". Art Max Academy. ^ Farhat, Hormoz (1990). The Dastgah Concept in Persian Music. Cambridge University Press. ISBN 052130542X. ^ Kenrick, Donald (2010). The A to Z of the Gypsies (Romanies). Lanham, MD: Scarecrow Press, Inc. p. 43. ISBN 978-0-8108-7561-6. ^ Kiani, Majid. "Master of the Santur". Santur Master, Teacher & Performer. ^ Khan, Mohammad Sadeq. "One of the oldest Santur Masters". Master of the Santur. ^ Shahi, Ali Akbar. "Santur master". Old school santur player. ^ Khan, Hassan. "Santur Master". Old school Santur Master. ^ Malek, Hussein. "Santur master". Old School Santur Master. ^ Somai, Habib. "santur master". Old school Santur master. ^ Varzandeh, Reza. "Santur Master". Unique Style of Playing. ^ Shafieian, Reza. "Saba's Student". Santur Master. ^ Sarami, Mansur. "Santur Master". Old School Santur player. Archived from the original on 2006-05-02. ^ Shaari, Masoud. "Santur Master". Old School Santur Master. Archived from the original on 2006-05-02. ^ Safvat, Daryoush. "Santur Master". Old school Santur master. Archived from the original on 2006-05-02. ^ Akhbari, Jalal. "Old School Santur Master". Master of the Santur. Archived from the original on 2006-05-02. ^ Arfa, Atrai. "Santur Player". Santur Soloist. ^ Hashemi, Azar. "Female Santur Player". Santur Soloist. Archived from the original on 2006-05-02. ^ Aslani, Susan. "Female Santur Player". Santur Soloist. Archived from the original on 2006-05-02. ^ Ali Pour, Manijeh. "Female Santur Player". Old School Santur Player. Archived from the original on 2006-05-02. ^ Al-Hanafi, Jalal (1964). Al-Mughannūn al-Baghdādīyyūn wa al-Maqām al-ʻIrāqī. Baghdad: Wizarat al-Irshad. ^ Tani, Dr. Masato. "Japanese Santour Player". Ethnomusicology. Al-Hanafi, Jalal (1964). Al-Mughannūn al-Baghdādīyyūn wa al-Maqām al-ʻIrāqī. Baghdad: Wizarat al-Irshad. Touma, Habib Hassan (1996). The Music of the Arabs, trans. Laurie Schwartz. Portland, Oregon: Amadeus Press. ISBN 0-931340-88-8. Duchesne-Guillemin, Marcelle (1980). "Sur la restitution de la musique hourrite". Revue de Musicologie 66, no. 1 (1980): 5–26. Fink, Robert (1981). The Origin of Music: A Theory of the Universal Development of Music. Saskatoon: Greenwich-Meridian. Gütterbock, Hans (1970). "Musical Notation in Ugarit". Revue d'assyriologie et d'archéologie orientale 64, no. 1 (1970): 45–52. Heydarian, P.; J.D. Reiss (2005). "The Persian music and the santur instrument" (PDF). Proceedings of Sixth International Conference on Music Information Retrieval, London, UK. 11. pp. 524–527. Kilmer, Anne Draffkorn (1971). The Discovery of an Ancient Mesopotamian Theory of Music. Proceedings of the American Philosophical Society 115:131–49. Kilmer, Anne Draffkorn (1974). "The Cult Song with Music from Ancient Ugarit: Another Interpretation". Revue d'Assyriologie 68:69–82. Kilmer, Anne Draffkorn (1997). "Musik, A: philologisch". Reallexikon der Assyriologie und vorderasiatischen Archäologie 8, edited by Dietz Otto Edzard, 463–82. Berlin: De Gruyter. ISBN 3-11-014809-9. Kilmer, Anne (2001). "Mesopotamia §8(ii)". The New Grove Dictionary of Music and Musicians, second edition, edited by Stanley Sadie and John Tyrrell. London: Macmillan Publishers. Kilmer, Anne Draffkorn, Richard L. Crocker, and Robert R. Brown (1976). Sounds from Silence: Recent Discoveries in Ancient Near Eastern Music. Berkeley: Bit Enki Publications, 1976. Includes LP record, Bit Enki Records BTNK 101, reissued [s.d.] as CD. Vitale, Raoul (1982). "La Musique suméro-accadienne: gamme et notation musicale". Ugarit-Forschungen 14 (1982): 241–63. Wellesz, Egon, ed. (1957). New Oxford History of Music Volume I: Ancient and Oriental Music. Oxford: Oxford University Press. West, M[artin]. L[itchfiel]. (1994). "The Babylonian Musical Notation and the Hurrian Melodic Texts". Music and Letters 75, no. 2 (May): 161–79. Wulstan, David (1968). "The Tuning of the Babylonian Harp". Iraq 30:215–28. Wulstan, David (1971). "The Earliest Musical Notation". Music and Letters 52 (1971): 365–82. Wikimedia Commons has media related to Santur. This page was last edited on 31 March 2019, at 03:57 (UTC).